First Wind's 30 MW Kahuku wind power project in Hawaii is helping the island state move to renewable energy—and features a 15 MW system said to be the largest energy storage system integrated with a wind farm in North America. Perhaps more than any other U.S. state, Hawaii can benefit in a very significant way from developing sources of alternative energy. The island state has no traditional energy sources (oil or natural gas) of its own and is dependent on burning imported oil to generate electrical power. That situation is starting to change, and the state government, utilities, and renewable energy companies are looking to move Hawaii along the alternative energy curve. One of the latest projects helping that shift to renewable energy is First Wind's 30 MW Kahuku wind power project on the North Shore of the island of Oahu, which was connected to the grid earlier this year. Interestingly, when doing the planning and development work for the Kahuku project, First Wind benefited from a less than successful previous wind power project in the area dating back more than 20 years. The Hawaiian Electric Company tried out three different types of wind turbines in the Kahuku area in the 1980s and 1990s. They ran into problems with corrosion from the high salt content in the air, and the turbines were not very efficient. But the wind power industry is very different in 2011 and so is its equipment, and the Kahuku area possesses a wind resource that is just too good. "This area is one of the best wind sites on the island of Oahu," notes Wren Wescoatt, development manager for First Wind in Hawaii. "We first started looking at it in 2006 and then purchased 500 acres there in 2007, in an area that is very close to the site of the previous wind turbines." A big benefit to First Wind from the previous project is that residents were familiar with having wind turbines in the area and were generally supportive of wind power. "That was a big plus for us," says Wescoatt. In this kind of situation, the normal education/information process, usually required when building a new wind farm, probably would not have been necessary. "But we did it anyway," says Wescoatt. "The community said they already knew about wind power. But we went through a lot of the same steps. The knowledge level was already high. "The area residents who had been around for a while were already familiar with wind turbines; consequently, they had a lot of good questions. 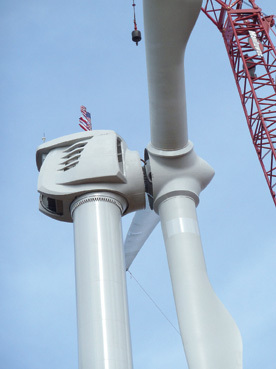 Instead of asking basic questions like what color the turbines were going to be, they were asking how many megawatts they would be and what we were going to do to prevent corrosion and make sure the turbines last longer. "It was a more sophisticated conversation with the community." In Hawaii, in general, the wind profile is not only reasonably strong, it is also very steady, says Wescoatt. "We have tradewinds that blow night and day, most of the time, from the same direction. And Kahuku is about a mile from the ocean, so we get the breeze coming in right off the water." The site itself is in the foothills of Oahu and is located near some shrimp and prawn farms, very close to the Turtle Bay Resort. That said, the area is generally agricultural—the wind power project was built on land formerly used to grow sugar cane. There are some unique challenges to building a wind farm in Hawaii. If you are building a wind farm in a large wind power state, such as Texas, land is generally fairly available. But land is scarce in Hawaii. Its modest 10,931 square miles could easily fit into a corner of Texas, with its 268,580 square miles. So there is the resulting pressure to make the best use of land in Hawaii. And the land carries a fairly hefty price tag. "That's one of the challenges we face," says Wescoatt. "The alternate uses of the land we are using have fairly high expectations in terms of financial returns. Land is very valuable here, and when it is developed, it is often developed for residential uses or for a resort, with a very high price tag. "It can be difficult to find land in Hawaii that may be suitable for wind development, and sometimes the cost is prohibitive because there are many other competing uses for the land." Those are the facts of life in Hawaii, but First Wind is familiar with them through the development of its first wind farm in Hawaii, the 30 MW Kaheawa wind farm on the island of Maui, which was completed in 2006. 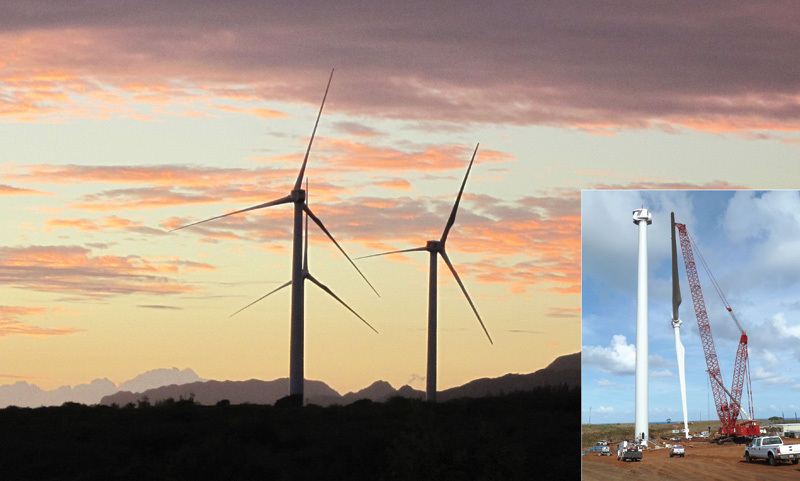 There were benefits to First Wind being an established wind power player in Hawaii, having a successful track record with the Kaheawa wind farm. "With Kaheawa, we were known for having a thorough community outreach effort, and making sure we listened to the communities that would be hosting these wind projects. "We had established a good track record, and the government agencies knew that we would be upholding the commitments we made to the community, so that definitely worked in our favor. They know that First Wind will walk the talk and honor our promises." The Kaheawa project, says Wescoatt, has exceeded all expectations—it is producing nine percent of the Island of Maui's power throughout the year, and it is a very steady performer. They were looking to repeat that success with the Kahuku project. First Wind selected Clipper Windpower's2.5 MW Liberty wind turbines for the Kahuku project on the North Shore of theisland of Oahu. In terms of logistics, Wescoatt reports that they had good access to the Kahuku site; a main highway was about half a mile away and building the access roads they needed was not a problem. In fact, access was excellent, says Wescoatt, but it was not due to the previous wind farm facilities. The U.S. Army does training in the area, and there is also a heavy equipment training center next door, so there were already good roads into the area. Topographically, the site consists of rolling hills, with elevations from 100 to 300 feet. Equipment and material were brought in through one of Oahu's harbors and then trucked out to the site. "That was a bit challenging, with some of the winding roads we had to traverse to get to the site." Due to its sensitive eco-system, Hawaii requires a much more demanding environmental approach than most states on the mainland. As with the Kaheawa project, First Wind developed a Habitat Conservation Plan for Kahuku. "In general, Hawaii has a very high incidence of species extinction, so the state has very strict environmental regulations and a very high level of concern for federally listed species," says Wescoatt. "Consequently, we approach the environmental requirements very seriously. "With our wind farms, we want to make sure we are doing the best we can with existing information to study species and develop a plan to create a kind of net benefit. We can't completely prevent a take incident, but we want to make sure that over the life of the project, we are creating a benefit to the species over and above any potential take that might occur." If there is a species that may be impacted, First Wind looks at how it can contribute to research and preservation programs. This includes work with the state on research programs for the endangered Hawaiian bat, and programs that incubate and raise chicks of endangered bird species. They also look to identify and protect colonies of endangered species off site, through predator trapping or fencing of sensitive wildlife areas. "Hawaii is a beautiful place, but it's very small and its resources are unique and very fragile. We want to make sure we take care of what's here and, as a company, that we don't negatively impact those resources." Once the project was approved, construction swung into high gear. They had some high wind days during construction, which caused some erection work to be slightly delayed, but construction proceeded well, and they finished the project ahead of schedule. "There weren't any hiccups in terms of construction efforts, but it was still an extremely complicated project," says Wescoatt. "A big part of that was the battery storage system." The project includes a 15 MW system said to be the largest energy storage system integrated with a wind farm in North America. The battery energy storage system assists in smoothing fluctuations in wind energy output. Xtreme Power is the developer and manufacturer of the Dynamic Power Resource (DPR) large-scale energy storage and power system used on Kahuku. The project marks Xtreme Power's largest commercial DPR currently in operation.